Take a look at this toy. Depending on where you stand on the aesthetic spectrum you may find it rather tacky, but there’s also something very endearing about it. It is sold on pavements and at traffic lights in metros across India, the latest in a line of quirky street-side toy fads that have in the past included items such as a birdcage shaped head tickler. People have been sufficiently entranced by its charms to make this little flowerpot a mass-produced phenomeon. In Delhi and Bombay it’s ubiquitous - I’ve seen it on office desks, window sills, toilet water tanks, and car dashboards are starting to look incomplete without one. It grabs your attention with its garishly bright colors and shiny plastic, making no pretenses of looking ‘natural’. But it moves in a surprisingly organic fashion. The leaves sway to and fro, with the flower nodding along in cheery unison. It sways in the breeze, but even if the air is completely still it keeps rocking to its own solar-powered beat. The American physicist Richard Feynman was once interviewed on BBC’s science program Horizon, where he made a case for science on aesthetic grounds. He was responding to a certain criticism of science - that it misses out on some essential aspect of our human experience by reducing the world to mechanics. Feynman retorted that when we consider a flower, our appreciation of its beauty may be informed by our aesthetic experiences, but the beauty is basically accessible to all of us who can perceive it. However, by asking more pointed questions about the flower - what is it for? how does it work? what was the world like before flowers? - we can gain a deeper appreciation. An understanding of science only adds to our appreciation of beauty, it does not detract. An ardent popularizer of this point of view is the biologist Richard Dawkins. On a personal note, his popular science books are the reason I got excited about biology, and nudged me into changing fields from physics. In a public conversation with the radio journalist Robert Krulwich, Dawkins was jovially taken to task with the same criticism that was offered to Feynman by his artist friend. Reductionists are the sort of people who like to take things apart and ask how they work. When a reductionist meets a flower, are they tearing its beauty to shreds? Dawkins’ response is a short and eloquent defense of the romance of science. Another great proponent of this science-powered humanistic view was the writer and anthropologist Loren Eiseley. Eiseley’s prose vividly illustrates the wonder, poetry and sense of mystery that is revealed an imagination guided by science. In his essay How Flowers Changed the World, he takes us on a journey through a “soundless, violent explosion” that spans many millions of years near the end of the Age of the Dinosaurs. That explosion was the invention of angiosperms - seed producing flowering plants that could now travel and colonize like never before. "The well-fed, carefully cherished little embryos raised their heads everywhere. Many of the older plants with more primitive reproductive mechanisms began to fade away under this unequal contest. They contracted their range into secluded environments. Some, like the giant redwoods, lingered on as relics; many vanished entirely. The world of the giants was a dying world. These fantastic little seeds skipping and hopping and flying about the woods and valleys brought with them an amazing adaptability. If our whole lives had not been spent in the midst of it, it would astound us. The old, stiff, sky- reaching wooden world had changed into something that glowed here and there with strange colors, put out queer, unheard-of fruits and little intricately carved seed cases, and, most important of all, produced concentrated foods in a way that the land had never seen before, or dreamed of back in the fish-eating, leaf-crunching days of the dinosaurs." "Every time we walk along a beach some ancient urge disturbs us so that we find ourselves shedding shoes and garments or scavenging among seaweed and whitened timbers like the homesick refugees of a long war... Mostly the animals understand their roles, but man, by comparison, seems troubled by a message that, it is often said, he cannot quite remember or has gotten wrong... Bereft of instinct, he must search continually for meanings... Man was a reader before he became a writer, a reader of what Coleridge once called **the mighty alphabet of the universe**." Now let’s consider, again, the case of our humble plastic flowerpot. Just as Eisley and Dawkins unravel the petals of a flower to reveal the layers of meaning beneath, is there a deeper aesthetic that we can appreciate if we prod beneath the plastic? The first thing that we notice is that it is remarkably uncomplicated. The age in which you can take something apart and figure out how it works is almost behind us, so this is somewhat of a surprise. If we remove the flower, petals and the pot, we are left with just 3 components : a tightly wound coil of wire, a solar panel, and a capacitor. Here is what is happening. A capacitor is a like a sponge for charge - it will soak up charge until it can’t hold anymore. The way you can build one is take 2 metal plates and put them close to each other, but don’t let them touch. If you hook each plate up to a terminal of a battery, they will build up opposite charges (+ on one plate, - on the other). Once you remove the battery, the attraction between the charges on the two plates locks the charges in place. However, if you connect the two plates with a wire, the charges will quickly flow down the wire and find each other, creating a transient current that ebbs away, discharging the capacitor. Now, we introduce a twist (sorry). Instead of connecting the two ends of the capacitor with a straight wire, you use a coiled wire to connect them. What this does is make an electromagnet - indeed any time you make a charge move, it creates a magnetic field. By coiling the wire, you get the magnetic field of the different bits of wire to all stack up and combine into one magnetic field that punctures through all the loops. Electric and Magnetic fields are two parts of one dynamic entity, as was worked out by many brilliant physicists of the 19th century. You can’t change one without creating the other. Moving electric charges, such as a current in a wire, create a magnetic field (visualized as lines in the above figure). 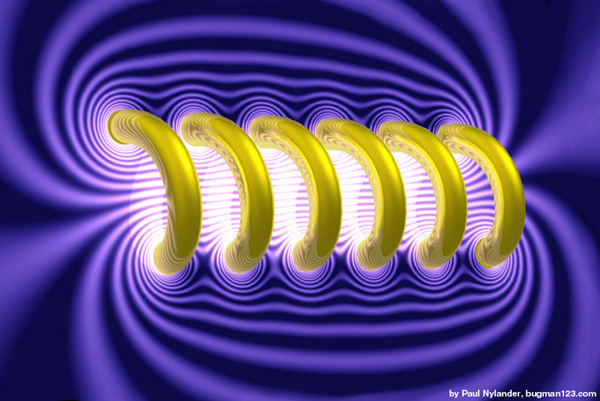 Changing magnetic fields, in return, create electric currents. In this way, what you end up with is a sloshing of energy between electric energy in the capacitor and magnetic energy in the coil. However, the energy doesn’t slosh about forever. Eventually the wire heats up and the coil gives out radio waves, leaking energy. So the role of the solar cell is to capture energy from particles of light and top off the energy balance in this little plastic microcosm. Taken together, these 3 components make an electromagnetic oscillator - the heart of the flower pot. Just like a biological heart, the circuit may not be much to look at, but its elegance is revealed through its function. It choreographs a subtle dance of the charges within, rhythmically creating and responding to invisible waves of electromagnetic energy. And by tapping to the beat of this dance, the swaying flower creates an illusion of cheerful alacrity! To be perfectly honest, people who have studied the equations that describe how electric and magnetic fields interact will find the above analogy lacking. I don’t blame them. Physical systems are most naturally described in the language of mathematics; to describe them in words is necessarily awkward. In many ways Maxwell’s equations share classical notions of beauty - for example, they exhibit a pleasing symmetry between the Electric and Magnetic fields. And just as musical notation can convey powerful emotions to those who know how to interpret it, these equations succinctly express the beautiful geometrical way in which Electricity and Magnetism are intertwined. As with reading music, it requires years of training to understand the language in which these ideas are expressed. Surprisingly, the equation that describes our oscillating circuit is the same that describes a ball swinging on a string, or a block attached to a spring. These systems are called harmonic oscillators, and they show up everywhere physicists look - from springs and strings to all sorts of waves (ocean, light, sound,..) and even to strange behavior of a quantum particle trapped in a tiny box. Physicists are delighted when unexpected mathematical connections bridge together seemingly disparate phenomena. It is this generality that makes the subject truly exciting, as by swinging a pendulum we are also learning something about what is going on in an atom or in a spinning neutron star. An experiment, from a certain point of view, is then a way to transcend our parochial, everyday experiences and explore the universe beyond. "Francis Thompson, the English poet, once wrote that one could not pluck a flower without troubling a star. Intuitively he had sensed like a naturalist the enormous interlinked complexity of life." By plucking a flower we perturb a star, and by taking things apart we are, in some sense, disturbing the universe. Letter by letter, we are slowly uncovering the mighty alphabet. Welcome to Empirical Zeal. I hope you enjoy your stay here!